making a gallery which it covers with brown silk and frass. 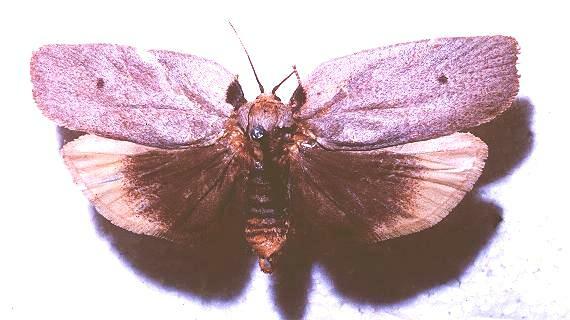 The adult moth has grey-brown forewings, often with a dark dot near the middle of each one. 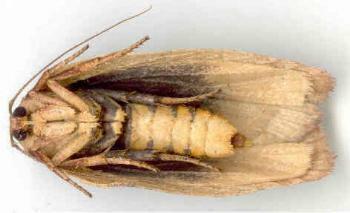 The hindwings are black fading to pale yellow at the margins. The body has alternate bands of black and orange. 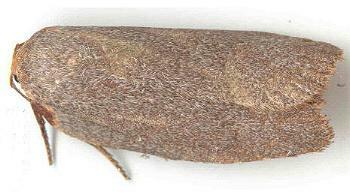 The moths have a wing span of about 5 cms. Note that Walker's type specimen came from Brisbane, so that specimens from areas in the Tropics may be misidentified, and actually be Uzucha borealis, as both species show variable colouration. But Walker and Turner distingished their species by colour, so that Uzucha humeralis should also be the darker species. Melbourne University Press, 1990, fig. 23.6, p. 228. Blog, Thursday, July 1, 2010. Part 29 (1863), p. 826, No. 70.